(CBS News) Proper car seat use is a problem for kids in the United States, a new study suggests, with many parents ignoring or unaware of current guidelines that ensure a child's safety in the risk of a vehicle accident. Car crashes are the leading cause of death for children older than 3 in the U.S. and cause another 179,000 child injuries each year. According to the Centers for Disease Control and Prevention, child safety seats cut death risk by 71 percent for infant passengers and 54 percent for toddlers between the ages of 1 and 4 - if they are used properly. Recent guidelines from the American Academy of Pediatrics call for exclusive use of rear-facing car seats in infants and toddlers until they reach 2 (or exceed the seat's weight or height maximums), followed by forward-facing car seats for kids older than 2 until they grow out of them based on the manufacturers' specifications. School-aged kids who are too big for a forward-facing car seat should use a belt-positioning booster seat, says the academy, until a seat belt fits properly, typically when the child is 4 feet 9 inches or between 8 and 12 years old. Older kids are recommended to use seat belts in the back seat of a car until they reach 13, an age the academy considers safe for teens to move to the front seat. The researchers behind the new study, published in the August 8 issue of the American Journal of Preventive Medicine, wanted to see how many kids - and their parents - were actually following these guidelines. They reviewed three years worth of data from the National Highway Traffic Safety Administration's 2007-2009 National Survey on the Use of Booster Seats. Nearly 21,500 children were included in the analysis, in which researchers would stake out gas stations, fast food restaurants and child care and recreation centers to observe proper restraint use as parents pulled up to these establishments with their children. The researchers interviewed drivers about their child's age, race and ethnicity. Their analysis showed that as kids got older, car seat safety and proper restraint techniques went down. As age increased, children were more likely to sit in the front seat of a car unrestrained, despite the guidelines. Within each age group, the researchers found minority children were less likely to use the guideline-recommended safety measures for car restraints compared with white children. Those disparities ranged from black and Hispanic infants being 10 times more likely to be unrestrained in a car compared with their white counterparts to older black and Hispanic children being up to 20 times more likely to be improperly seated in a car, driven by a higher propensity to be transitioned to a seat belt at an earlier age. Fewer than 2 percent of kids over 7 used a booster seat as recommended. Minority infants up to 3 years old were least likely to use a rear-facing car seat, but white infants weren't much better, with only 17 percent of those observed using a rear-facing seat. Eighty-four percent of the children using rear-facing car seats were younger than 1, despite the recommendations kids use them until they are 2 or grow out of the seat. "The most important finding from this study is that, while age and racial disparities exist, overall few children are using the restraints recommended for their age group, and many children over five are sitting in the front seat," says Dr. Macy. "Our findings demonstrate that not all children have been reached equally by community-based public education campaigns and the passage of child safety seat laws in 48 states. Further development and dissemination of culturally specific programs that have demonstrated success in promoting restraint use among minority children are necessary." Parents could also use some education about their own habits. The study found that a driver who didn't wear a seat belt was 23 times more likely to have a child who was unrestrained in a car seat. The American Academy of Pediatrics has more information on proper car restraint use. Parents with a child in back with a car seat should also keep in mind another risk transportation groups recently warned about, leaving a child in a hot car and putting them at risk for deadly heat stroke. 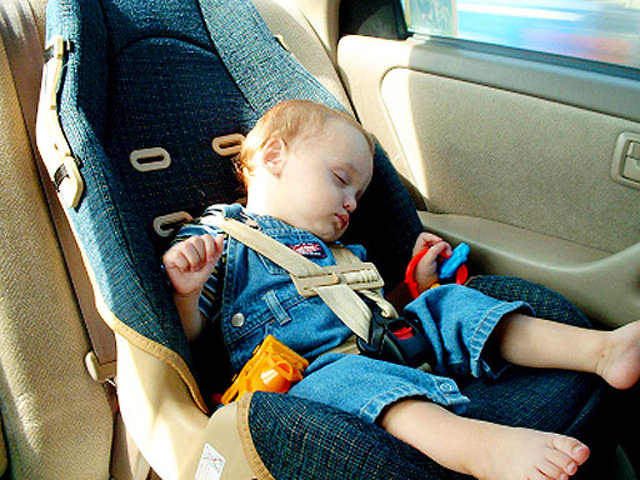 Parents may inadvertently forget a child is sleeping in a rear-facing car seat in the backseat, so the NHTSA urges parents to leave a briefcase or purse in the backseat as a reminder to force them to check. Also placing a stuffed animal in the front seat of a car can serve as a reminder a child is strapped into a car seat in the rear of the vehicle.